The lost gas due to flaring, venting, and leaks that ICF estimated on federal and tribal lands would be worth nearly $330 million at current prices. 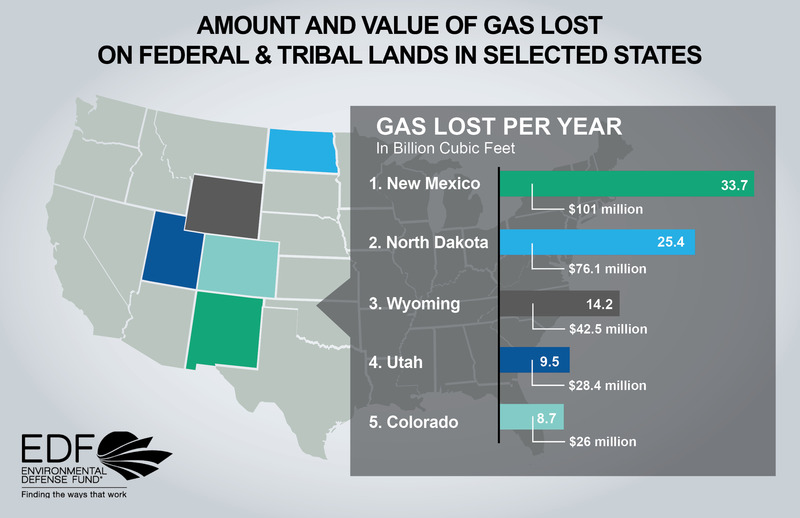 EDF developed the graphic below, which is based on ICF data and shows the volume and value of gas lost due to flaring, venting, and fugitive losses on federal and tribal lands for the top states in 2013. A portion of this value represents royalties that states are not able to collect – funds that could be invested in schools, health care and needed infrastructure improvements for local communities and tribes directly impacted by this development. Beyond economic losses, the environmental impacts of the massive emissions from drilling on federal and tribal lands are increasingly evident. In rural — but drilling-heavy — Pinedale, Wyoming, emissions from oil and gas activity generated so much smog that the town endured air pollution readings rivaling that of urban Los Angeles. In New Mexico, a massive methane “hot spot” was detected by NASA satellites over the San Juan Basin where much of the state’s gas drilling is taking place. Fortunately, the Bureau of Land Management (BLM), the agency charged with overseeing the responsible development of oil and gas on federal and tribal lands, is poised to propose new rules to reduce the waste and pollution. As the ICF report indicates that emissions from federal and tribal lands constitute about 12 percent of our nation’s total methane emissions from the oil and gas operations. We believe that these areas cannot be overlooked in the rulemaking process if we’re sincere about addressing this challenge. Methane emissions have already become a priority for many Western states. In 2014, Colorado became the first state in the nation to directly regulate methane from oil and gas operations, partly prompting the Western Governors Association to pass a resolution in support of oil and gas methane emissions reductions. Wyoming also requires stringent pollution controls in an area of heavy drilling activity. And the North Dakota Industrial Commission recently adopted a strong gas capture order that has resulted in significant reductions of flaring in the state. But these rules don’t apply evenly to all federal and tribal lands in these states, and they don’t apply at all to the other states in the region that ICF found contributed to fugitive and vented emissions. The ICF analysis highlights solutions to significantly reduce these fugitive and vented emissions. ICF examined a range of proven, cost-effective technologies and best practices that could be applied to the emission sources it evaluated, including frequent leak inspection and repair (LDAR) programs, and found that dramatic reductions could be realized using existing technologies that are already in use in many areas. All told, ICF identified a potential to reduce emissions to the atmosphere by more than 25 billion cubic feet of whole gas per year, or nearly 40 percent of total gas emissions, by practicing well-known and highly cost-effective pollution reduction strategies. 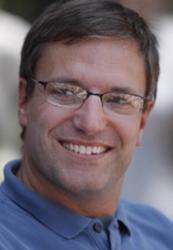 The report estimates that emissions on federal lands could be reduced at a net savings of 62 cents per thousand cubic feet (Mcf) of gas conserved, and that emissions on tribal lands could be reduced at a net cost of 25 cents per Mcf of gas conserved (less than a penny per Mcf of gas produced). One thing we should all be able to agree on is that oil and gas companies extracting public resources on public lands should be held to the highest of standards, doing everything feasible to protect our health and climate from harmful emissions, minimize energy waste, and maximize royalties to taxpayers. BLM is responsible for leasing and regulating approximately 700 million acres of lands with publicly owned mineral resources, an area roughly four times the size of the state of Texas. The agency has a dual legal responsibility to ensure that the rules it proposes for this significant portion of the U.S. conserve oil and gas resources and protect our air and climate. BLM’s proposed standards should fulfill that responsibility by reflecting the key opportunities we know exist to cost effectively reduce waste and emissions in the oil and gas sector – and it should act quickly, before even more public resources go to waste. Is BLM Phoning It In? This entry was posted in Climate, Colorado, Methane, Natural Gas, Wyoming and tagged BLM, Colorado, Natural Gas, New Mexico, north dakota, Utah, Wyoming. Bookmark the permalink. Both comments and trackbacks are currently closed.